Right, let me get something off my chest. The word "gourmet" gets thrown around far too much in the takeaway or street food arena. It doesn't belong there any more than the term "trakkie bottoms" at Dior, "glamour" at the dog racing or "demure" on a Saturday night down West Street. It pisses me off no end. The pizza is a beautifully simple thing; rustic, honest, working class food for the masses. Yeah you need a sprinkling of talent to make a decent one, and a good understanding of chemistry probably helps too but every time you put the words "pizza" and "gourmet" together a Neapolitan fairy dies. Word. Norris has been with us for a few years now, he's not too much trouble and needs feeding every week and generally he's a pretty reliable fellow. We got him from Gerald, the sourdough starer at the amazing Lighthouse Bakery. But tonight he let us down. The dough was a no go, but the hankering for pizza was just too strong. With a few of the usual suspects tried lately; Pizzaface, Pronto in Tavola and Pizza 500, Gourmet Pizza Kitchen was the next try. We ordered early and it was mid-week so delivery time was spot on. The base, and it's all about the base, I have to say was the ideal thickness. I am done with paper thin bases as much as the thick and heavy. When I eat, I want to actually eat - half of the pizza bases around here can barely support air let alone any toppings they are so thin but GPK ones have a good chew and ideal at around 4mm. I think being on the opposite side of Brighton, the pizza suffered a little. It should really be eaten blisteringly hot out of the oven and ours was lukewarm and the cardboard taste from the box had transferred a little, but still, the chew and thickness was on the money. Texture-wise there could have been a little more lightness and air and a heavier pinch of salt, but I would be keen to eat in and try them at their best. The topping choices are one of the things that have historically put me off GPK, some even warranting a letter of apology to the entire nation of Italy. Cream features heavily (WTF?) and some sound vile (Lamb, Aubergine & Feta and yes my pet hate of pizza fusion; Peri Peri Chicken, Hoi Sin Duck (with cream - puke), Salt Beef and Gherkin (you think I'm fricking joking now?) or Butternut Squash and Blue Cheese.) I think I even saw cucumber as one of the toppings, the thought of which raises my blood pressure. I learnt many moons ago to go simple with pizza. Margarita or prosciutto and cheese is as far as I go. My Margarita was fine, edible enough on the sofa with a half bottle of wine - I always think you can take off a third of the cheese, but this wasn't over the top. The pepperoni was fine too - thin and thankfully not those edge curling discs that the fat pools into. So many people rate GPK, many of whom live within the vicinity and probably eat them at their best. Or maybe they just aren't as fussy as I am. As well as their obvious fans, would I recommend a pizza here? Well go for it, why not, knock yourself out. 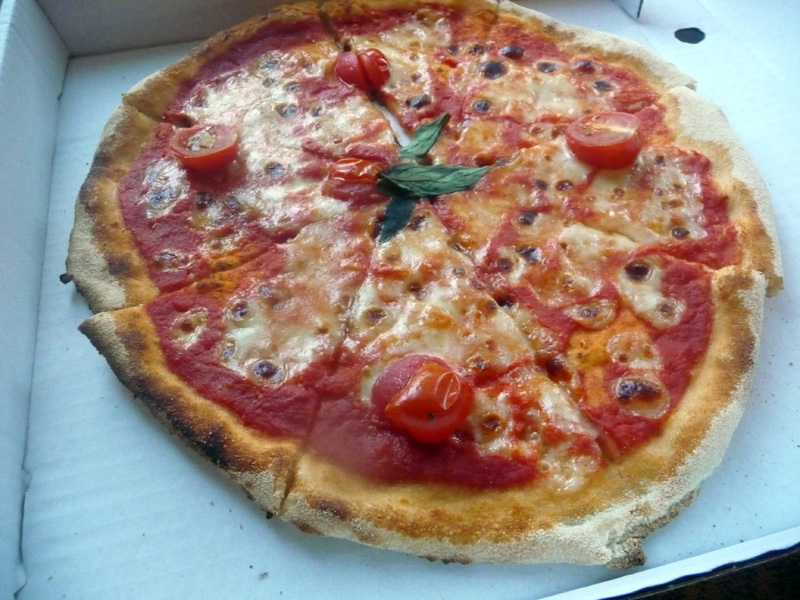 You can sure as hell do a lot worse locally but you can pick up a far, far better pizza in many of the back end dodgy streets in Italy for a few Euros. 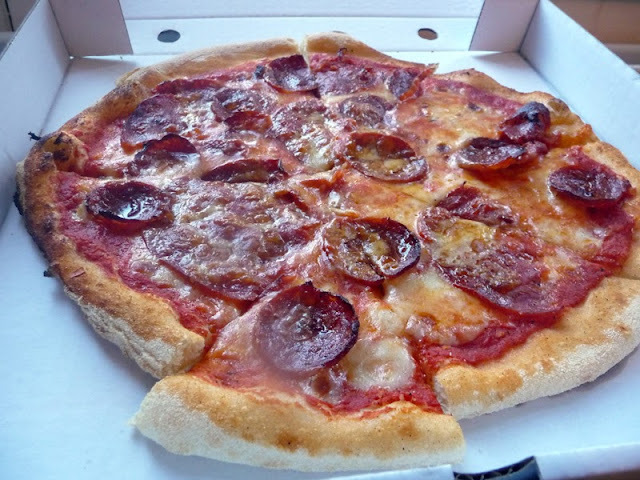 Pizza here hovers around the £10 mark. You shouldn't be paying more than that for a pizza unless you are extremely rich and stupid or just plain stupid. Maybe opt for the eat in and keep it basic with the toppings. I wouldn't rule out a re-order but I'm certainly in no rush. Simplicity is clearly one of the most difficult things to master.